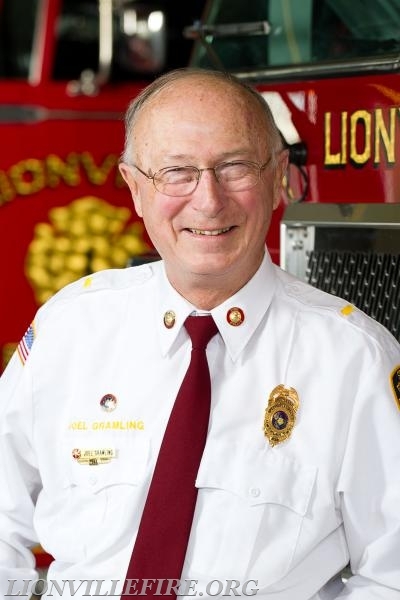 It is with profound sadness that the Lionville Fire Company announces the passing of our dear friend, current Fire Police Captain and Life Member, Joel Gramling, today, February 26, 2018. Joel has been a member of the Lionville Fire Company since 1973. Over his 45 years with LFC, Joel served as a Firefighter, Fire Police Officer, Fire Police Lieutenant, and Fire Police Captain, as well as being a past Fire Company President and Recording Secretary. Joel loved serving his community. Along with his Fire Police duties at Lionville Fire Company, Joel also volunteered as a Fire Police Officer with both Ludwigs Corner Fire Company and Downingtown Minquas Fire Department. He was a founding father of the Lionville Youth Association (LYA), and served as an umpire for over 40 years. Joel was also a longtime member of the Uwchlan Ambulance Corps. Joel was a loving husband, father and friend to many…. He also wasn’t shy about his love of the Green Bay Packers. Please join us in offering support and condolences to Linda and the entire Gramling Family, as well as their extended family and friends. Joel has answered his last call. Our thoughts and prayers to Linda and the family. A sad time but many happy memories. Prayers go out to Linda and the family. Joel was a friend, he served his community for many year. R.I.P. Such a great loss to our community. Joel was always one we could count on for a smile and willingness to help. He will be missed. My heartfelt condolences to his family. Rest easy Joel. You will be missed. Joel was a great guy and will be sadly missed. I am sorry to hear about Joel. I came to know him well during my time in the general assembly. He was dedicated to his community. Could always find him at any community event in Lionville or Downingtown where traffic was a concern. One of the nicest people I met during that time. A great guy and a class act. Rest In Peace, my friend. Your positive attitude and warm smile will be sadly missed. Your help over the years was greatly appreciated. Sincere condolences to the Gramling family and the members of Lionville Fire Company. What a wonderful caring indidual, Joel always greeted you with a warm smile. He will truly be missed. God bless you and your family at this difficult time. Joel will be missed greatly by the community. I was sad to hear of his passing. My condolences to his family! RIP JOEL!! My deepest sypathy's to the Grambling family, I will always remember Joel always having a smile no matter how bad things got. Thank you for your service to our community. We are so greatful. Thank you to your family for all the sacrifices they have made . Our thoughts and prayers go out to Linda and the Gramling family. Joel was one of the main stays of the Lionville community. He was always there when you needed him and did some much for the youth of our area by being a founder of LYA. So sad to hear of Joel's passing he was very dedicated to the public service life as a member of Uwchlan Ambulance Corps, Ludwigs Corner Fire Company, Lionville Fire Company and other local fire companies. He will be greatly missed. Linda, sorry for the loss of your soulmate. Joel and Linda have always been dedicated to family, friends and community. Joel always had a smile and ready to lend a hand. Over 40 years of friendship, he will be greatly missed. Hearts and prayers to Linda and her family. I worked with him on many occasions with Ridge Fire Company he will be missed . My deepest condolences for the passing of Joel. He truly was a dedicated, kind and great man. He will be surely missed.